English author; born at Enfield, Middlesex, May, 1766; died at Bradenham Jan. 19, 1848. 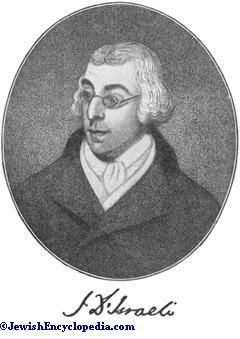 He was the only son of Benjamin D'Israeli, and after completing his studies and travels, he first appeared in print (Dec., 1786) with a vindication of Dr. Johnson's character in the "Gentleman's Magazine." In 1790 he published his first volume in verse, entitled "A Defense of Poetry." An attack on "Peter Pindar" (Dr. T. Wolcot) first drew attention to D'Israeli, and he soon obtained introductions to various literary men. Now finally adopting a literary career, the following twenty years of his life were spent in the production of a succession of literary works, which rapidly made his reputation and met with considerable success. In 1791 he issued anonymously a collection of ana entitled "Curiosities of Literature," which had an immediate vogue. He added a second volume in 1793, a third in 1817, two more in 1823, and a sixth in 1834. "A Dissertation on Anecdotes" appeared in 1793, "An Essay on the Literary Character" in 1795, "Miscellanies of Literary Recollections" in 1796, "Calamities of Authors" in 1812-13, and "Quarrels of Authors" in 1814. These works contain a large amount of interesting matter, not always very reliable, on the lives of authors, and have formed a fund of anecdotage from which succeeding writers have drawn copiously. Their accuracy was impugned by Bolton Corney, who opened with D'Israeli a fresh chapter of the "quarrels of authors" in 1837-38. D'Israeli also tried his hand at romances; but these were never successful. In 1797 three were published—viz., "Vaurien: A Sketch of the Times"; "Flim-Flams, or the Life of My Uncle"; and "Mejnoun and Leila, the Arabian Petrarch and Laura," said to be the earliest Oriental romance in the English language and which was translated into German in 1804. 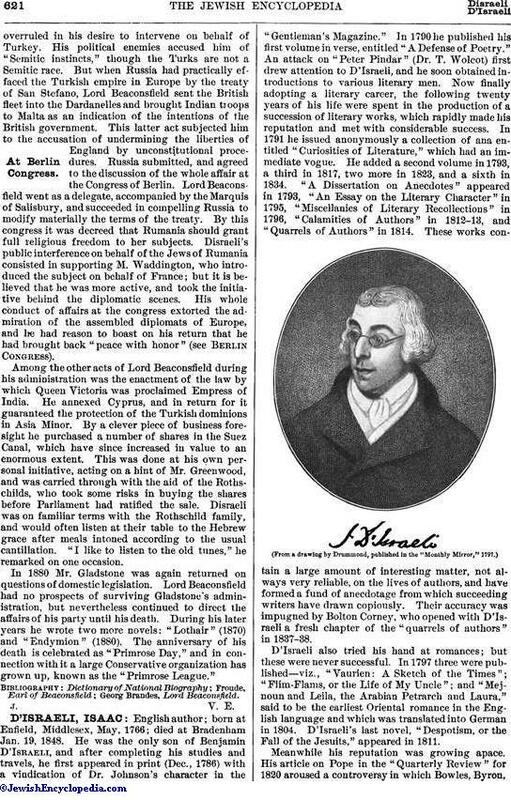 D'Israeli's last novel, "Despotism, or the Fall of the Jesuits," appeared in 1811. Meanwhile his reputation was growing apace. His article on Pope in the "Quarterly Review" for 1820 aroused a controversy in which Bowles, Byron,Roscoe, and Campbell took part. Between 1828 and 1830 appeared in 5 vols. D'Israeli's "Commentary on the Life and Reign of Charles I.," based on original documents. In recognition of this production he was made a D.C.L. at Oxford in 1832. In 1833 he issued anonymously the "Genius of Judaism," in which he wrote enthusiastically of Israel's past history, but deplored its social exclusiveness in his own day. He had expressed similar views in his "Vaurien" (1797), and in an article on Moses Mendelssohn in the "Monthly Review" for July, 1798. Religiously, Isaac D'Israeli was a man far in advance of his times, and was perhaps the first English Jew who took the modern attitude toward Jewish ceremonial. In 1813 D'Israeli was elected warden of the Bevis Marks Synagogue, to which both he and his father had been attached. This office he declined, expressing surprise that he should have been elected at so late a period in his life. No notice was taken of his communication; and in accordance with established usage the recalcitrant was fined £40. Some correspondence ensued, in which D'Israeli, after expressing his unwillingness to pay the fine, finally saying: "I am under the painful necessity of wishing that my name be erased from the list of your members of Yehedim." D'Israeli never returned to the Jewish fold, and his sons and connections embraced the Christian faith. D'Israeli himself did not, however, receive baptism, and never evinced any desire to exchange Judaism for Christianity. He attended the inauguration ceremonies of the Reformed Synagogue at Berkeley street, London. 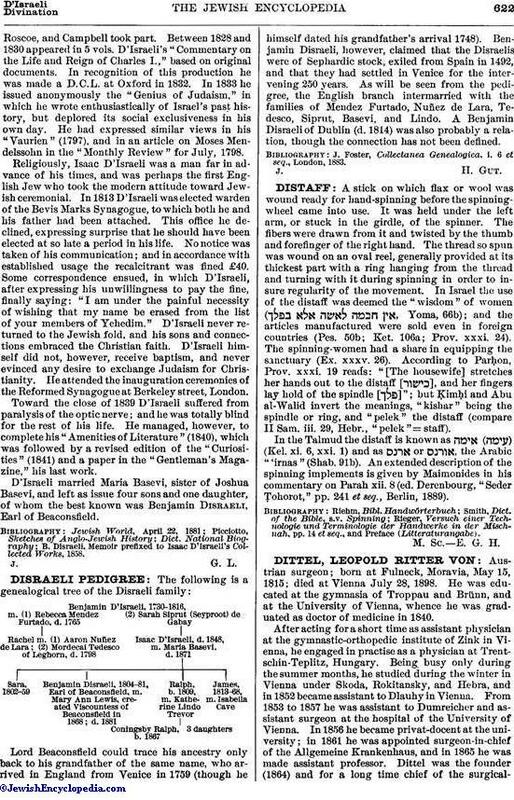 Toward the close of 1839 D'Israeli suffered from paralysis of the optic nerve; and he was totally blind for the rest of his life. He managed, however, to complete his "Amenities of Literature" (1840), which was followed by a revised edition of the "Curiosities" (1841) and a paper in the "Gentleman's Magazine," his last work. D'Israeli married Maria Basevi, sister of Joshua Basevi, and left as issue four sons and one daughter, of whom the best known was Benjamin Disraeli, Earl of Beaconsfield. B. Disraeli, Memoir preflxed to Isaac D' Israeli's Collected Works, 1858.